A SHY, AWKWARD teen with a brilliant mind for learning, her greatest wish is to be a teacher. Never in her wildest dreams does she imagine that her path will lead to a brand-new seminary in Gateshead, then to postwar Navardok in the French countryside, and finally to the Brooklyn community of her beloved rav, Rabbi Avigdor Miller, zt”l. In this story that is sometimes humorous, sometimes poignant, and always riveting, read about adventures in Morocco, a hypnotist in Gateshead, a shidduch in a postwar Navardok yeshivah, and inspiring moments in Rav Avigdor Miller’s closeknit Brooklyn community. 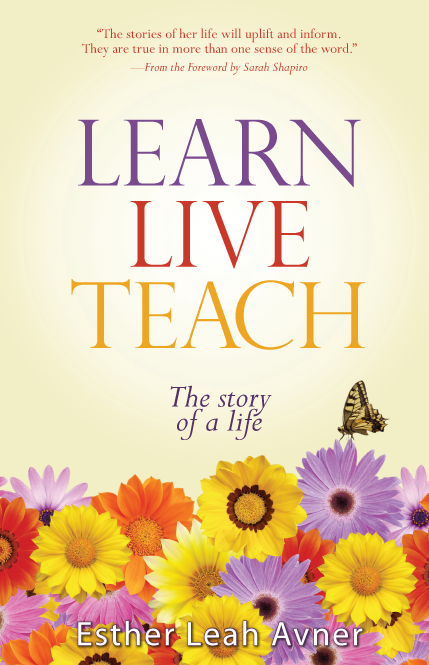 Learn, Live, Teach is the amazing, not-to-be missed tale of of an extraordinary life by consummate storyteller and popular lecturer Esther Leah Avner. ESTHER LEAH AVNER is one of those rarest of writers, someone whose innermost self—as has become apparent to me over the last decade—is like the unblemished page referred to in Pirkei Avos. Her mind and heart are imprinted with Torah values exclusively, not only by virtue of her parents’ influence and her deep involvement with the great Torah institutions of Gateshead and Navardok and with Rabbi Avigdor Miller, but because she does not permit herself—and has no inclination whatsoever—to cast her eyes elsewhere. This is writing that can be trusted to have arisen from pure sources; feel free to let down your guard. You may open yourself in innocence to the elegant pleasure of her eloquence and to the entertainments that await you. The stories of her life will uplift and inform. They are true in more than one sense of the word. IMAGINE SIX SEMINARY girls in Gateshead of the 1950s. It is the night of the coronation of Queen Elizabeth II, and they want to celebrate. Off they go to the recently opened kosher café in Newcastle for a cup of coffee, feeling very posh…only to discover, upon arriving, that they don’t have enough money for a piece of cake to accompany the coffee. Modestly, humorously, Rebbetzin Esther Leah Avner regales us with tale after tale from her extraordinary life. Again and again, she surprises us with the strength of her personality and her unshakeable bitachon in Hashem, which shine through in the stories that fill her recently published book, Learn, Live, Teach: The Story of a Life (Brand Name Publishing, 2011). But the story doesn’t start in England. Rebbetzin Avner was born in Belfast, Ireland, where her family was among the few Shabbos-observant Jews in town. She describes in vivid detail her personal introduction to anti-Semitism on the first day of public school as a lone 5-year-old Jewish girl in a class full of Irish Catholics, and the terrifying blitzkrieg period of World War II. She shares stories of her father’s earnest desire to bring Torah to the Jews in town, and of her gentle mother, the soul of honesty, who sought to protect her children from all harm, even at the expense of her own health. Through a strange yet miraculous series of hashgachah pratis events that occurred when Esther Leah, at age 19, prepared to go to college, she found herself dispatched instead to the newly founded Gateshead Seminary, under the auspices of Mr. Avrohom Kohn. Several years later, she married a Navardoker talmid learning in France. She didn’t discover, until after their wedding, that he spoke a fine English. Rabbi Gershon Liebman, their rosh yeshivah, had established the yeshivah immediately after the war, intent on educating young Jews in the Navardok style of minimal gashmiyus and complete bitachon. Esther Leah Avner immediately began to teach in the newly established seminary in Fublaines, putting her years in Gateshead to good use. Later in life, when Esther Leah meets Rav Avigdor Miller, zt”l, she feels an immediate affinity for this dignified, American-born rav, and she becomes an integral part of his communityan entire story on its own. Rather than simply chronicling the past for posterity, Esther Leah Avner brings to life the people she’s known and the places she’s visited in a delightful, upbeat fashion. She retains her sense of humor despite many a difficult challenge and reveals facets to her personality that will resonate with her readers. Learn, Live, Teach is a work that promises to inspire and uplift, educate and illuminate, just like its gifted author. It is a treat not frequently encountered in the library of Torah literature. ESTHER LEAH AVNER is a popular lecturer of hashkafah and mussar topics and a regular contributor to several publications. A favorite project is her participation in the Mussar Vaad network established by Rabbi Zvi Miller, dean of the Salant Foundation. Under his auspices, she serves as coordinator of two weekly mussar va’adim for women. Six years ago, she made aliyah with her husband, and they now reside in Jerusalem. When she is not teaching or writing, she enjoys spending time with her children and grandchildren. WE CHILDREN FELT like outcasts in the gentile town of Belfast, and, to complicate matters a little more, we were also impoverished. Were our parents aware of our feelings of isolated friendlessness? I do not know. Certainly we never complained. I, for one, accepted this as the inevitable consequence of our birth and religion, of which I was profoundly proud. If loneliness was the price to pay for the honor of belonging to the people of Hashem, then I would pay it gladly. And, of course, there was always the company of my siblings, though we were several years apart. Nevertheless, I longed for a friend of my own, and one day, at the age of ten, I envisaged a way to fill the void. I had read a children’s book about a family with a dog. It was a secular story, of course. In those days there were no Jewish publications for children in English and, for that matter, precious little for adults either. Be that as it may, the idea that began to take root in my mind was nothing short of the daring, fantastic notion that I, too, might possess a canine friend. At first, I did not venture to even contemplate this childish concept of paradise. From my parents’ point of view it would be unthinkable. Orthodox Judaism frowns on possession of a ritually unclean animal for all except utilitarian purposes. I was well aware that providing company for a lonely little girl did not fall into that category. And anyway, where would I find the money for its purchase? Still, the idea, once entertained, would not be easily abandoned. And then, one day, events transpired that were to transport the unimaginable into the realm of possibility. About this time, my mother underwent some rather serious surgery requiring a prolonged period of convalescence and bed rest. Since our budget did not extend to keeping a housekeeper during this time, the brunt of the domestic burden fell upon my tender and not-so-capable ten-year-old shoulders. For once, I needed no bidding to retire, but would collapse into bed each night at an absurdly early hour in total exhaustion. My father was astounded. He attempted to reason with me, pointing out that he had been thinking in terms of my usual beloved books or perhaps a doll or doll’s tea set. But I remained adamant. “You said whatever I want,” I reminded him, well aware that as the soul of honor, he always kept his word. My exasperated parent produced his trump card. The gift fund amounted to two shillings and sixpence. Where would I find a dog for that price? He hadn’t reckoned on his daughter’s tenacity. I studied the newspapers and discovered that one could indeed procure an abandoned dog from the animal shelter for a nominal sum. Victory was mine! I named my little mongrel Twinkle, and he surpassed all my expectations. At last I had what I had sought—a friend who loved me exclusively, unconditionally, enthusiastically, and with the utmost devotion. It did not surprise me that the Talmud says that the dog is a symbol of loyalty among beasts. I showered upon him all my pent-up emotions of frustrated affection. For over a year, we lived for each other. And then—tragedy. Twinkle became ill and refused his food. Alarmed, I took him to the vet, bought him medicine, and fed him morsel by morsel. In vain. Twinkle became weaker day by day until he lapsed into a coma. And still my mind refused to grasp the reality. He was my dog whom I loved. Nothing could happen to him. One afternoon, I came home from school for lunch and found him missing. “Where is Twinkle?” I enquired with feigned casualness. I did not weep before my parents. My parents were wonderful people, compassionate and loving. But they were members of a generation that believed that it was cruel to arouse sad or negative emotions in children by encouraging them to speak of such feelings if the children did not do so themselves. Instead, stunned with anguish, I could only stare at my food. Later I returned to school. On the way the dam burst, and I began sobbing uncontrollably. Two weeks later, I had still not recovered. I went through the motions of eating, sleeping, going to school, and doing my homework. But all the time my heart was crying for my lost friend. I was bewildered by my emotions. I did not know that this was grief, a natural reaction to such a loss. One day, a friend called upon my mother. I was seemingly engrossed in a book, so they felt at liberty to talk freely. I suppose that eventually I returned to normal. Perhaps Hashem was preparing me for the future losses of human loved ones that lay in store for me, for all too soon I was to lose my father.